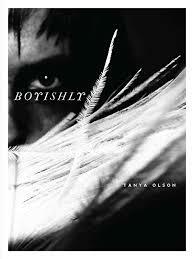 Tanya Olson's debut poetry collection Boyishly opens with a quote from Orlando by Virginia Woolf: “He was young; he was boyish; he did but as nature bade him do.” It's a fitting beginning, a frame through which to view this collection of love poems, folk tales, and the spaces where they overlap. In Olson's poems, the “he” of the epigraph might be the speaker or it might be America – a young, brash, subversively masculine America, striding through the pages driven by instinct and desire, doing but as nature bids him do. Olson's poems hint at the power of naming, the ability to become what you want to be by speaking it. The doctrine here is not “fake it 'til you make it,” because nothing about this re-definition is insincere. Through incantation and faith, Olson summons America neither as it is nor as it could be, but as believing allows it to be. to be a tiny man inside a giant whale. How there is no God but God inside any whale. Like Jonah with his whale, this America is to be both loved and feared. Olson's poems explore the threshold between these two emotions, lingering in the moments when one could transform into the other, as in the collection's first poem, “Exclude All Other Thoughts.” Here, hinting at a terrible and grand mystery, the speaker explains how to subdue an animated corpse: “Cling to it, / repeating your words to yourself. / Keep your mouth upon its mouth.” This sense of horrified determination – of clinging to what frightens you until it becomes familiar, if not precisely safe – permeates many of the collection's poems, conveyed through unexpected, sometimes disorienting repetitions. These repetitions and the persistence they embody imbue the ordinary stuff of history and autobiography with an aura of heroism, of obstacles overcome. should I dream. But of home. And home and home. What else to want. But to be a boy and a boy and a boy. Here, as elsewhere in the collection, repetition elevates the poem from verse to invocation, from letter to prayer. This boyhood is not inherent but performative, something that must be rehearsed and repeated before it can be perfected, the way Olson's poems often repeat and twist a phrase over and over again until they get it right. This is echoed in the poem from which the collection takes its title, wherein the speaker “practiced / pulling my t-shirt on like a boy (2 arms / neck) not a girl (neck 2 arms).” The tangible details of gender reverberate through a never-ending “boyish summer,” in which “it seemed the summer that summer / was never done.” The omnipresent shadow of “boyish” conjures up a playful, skinned-kneed archetype “folded / in the apple tree” - but an archetype deliberately subverted, deliberately queered. to see as we have seen. that rehearses for space in space. Make us believe as the mother believed.